Audinate has introduced Dante AVIO, cost-effective endpoint adapters that enable audio professionals to easily connect legacy analog and digital audio equipment to Dante networks. This series features six new adapters including line-in and line-out analog adapters, a bi-directional AES3/EBU adapter and a bi-directional stereo USB adapter. Audicate states that each Dante AVIO adapter acts as a completely independent Dante network device, allowing legacy gear to enjoy the benefits of networked audio. These devices can now seamlessly transmit high quality, uncompressed audio streams over long distances without the noise and ground issues common to analog connections. It also allows for nearly unlimited scalability while providing incredibly low latency and easy configuration. The Dante AVIO Analog adapters are available as dedicated inputs or outputs with one or two channels of audio. Analog input adapters allow mixers, mic preamps, stage DIs and more to connect to a Dante audio network, while analog output adapters are perfect for driving amplifiers, powered speakers or recorders. Long runs of noisy analog cable can be eliminated and all signal routes are managed via Dante Controller software. 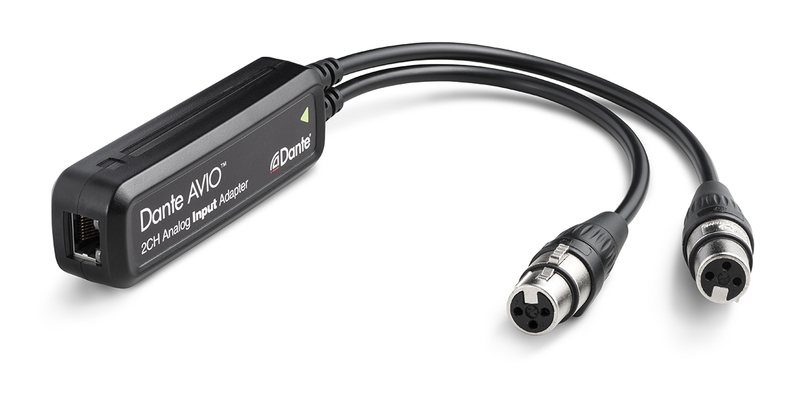 The Dante AVIO USB adapter connects any computer to a Dante audio network without additional software, providing class-complaint stereo input and output that can be used by any audio application. Ideal for presentations and conference rooms, the Dante AVIO USB adapter may be passed between computers without altering networked audio connections. The Dante AVIO AES3 adapter provides stereo input and output, preserving investments in AES3-connected DSPs, mixers, compressors, preamps and more. Any AES3 device may be fully connected to any Dante network with no degradation of signal due to extraneous D/A and A/D conversion. Audinate will display its new line of Dante AVIO adapters at the annual National Association of Music Merchants (NAMM) trade show in Anaheim.